(CBS/AP) OGDEN, Utah - A 35-year-old man has been arrested on suspicion of walking into a Catholic church and shooting his father-in-law in the back of the head during Mass, police in Ogden, Utah said. Charles Richard Jennings Jr., 35, was captured Sunday afternoon in nearby Box Elder County after fleeing in a stolen pickup truck, investigators said. Witnesses say they heard one gunshot during the 11:30 a.m. Mass on Sunday at Saint James the Just Catholic Church in Ogden, and that parishioners immediately hit the floor. The victim was taken to a hospital, where he was listed in critical but stable condition. His name wasn't immediately released. Police said the victim was deliberately targeted by the gunman. "We don't know the motive," Ogden police Lt. Danielle Croyle told The Salt Lake Tribune. "It is a domestic violence-related incident." A parishioner said the congregation was told by a priest that the suspect and his wife had been involved in domestic disputes. Parishioner Leon Bedford said the victim was sitting in a back pew with his wife when their daughter and son-in-law walked in holding hands as the congregation started saying a prayer. Bedford told the Standard-Examiner, "They came into the church hand in hand, and he walked right up to (the victim) and pulled that trigger. We just hope and pray that he makes it." 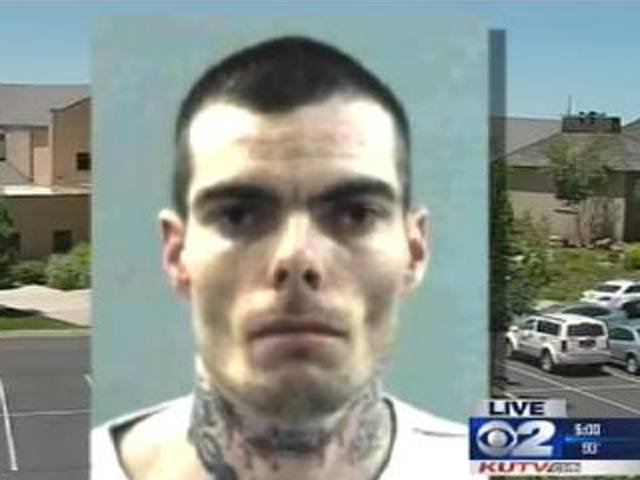 CBS affiliate KUTV reports the suspect's son was also present at the time of the shooting. Jennings was caught when the pickup truck he stole at gunpoint ran out of gas, police said. He was booked on charges of attempted aggravated criminal homicide and aggravated robbery.